In 1975, John Bogle, the founder of Vanguard did something extraordinary. He introduced the world’s first index fund. Toronto’s own Dan Bortolotti made index funds go viral in Canada with aid from his Canadian Couch Potato blog. Now, what the heck is an index fund? An index fund is akin to a mutual fund which uses computers to buy stocks and match the components of a market index (An example being S & P 500). Similarly, exchange-traded funds (ETFs) can be referred to as index funds too since ETFs track the index as well. Hence, index funds are famously known as “passive investing”. It is not an actively managed fund managed by a financial advisor. Science has shown again and again that majority of actively managed mutual funds fail to beat the market. After all, the financial professionals have their own research team and research analysts that help them to pick their mutual funds or stocks. Well, one thing is for certain: Nobody has the ability to predict the stock market especially individual stocks or “time” the market. Till date, no one has consistently beaten the market returns. One of the dominant reasons for actively managed funds failing to beat index funds would be the high management expense ratios a.k.a. MERs. Please feel free to replace MERs with a different set of four letters – FEES. Sadly, Canada has one of the highest mutual fund fees in the world. Mutual funds in Canada can have MERs as high as three percent. Research has shown that over the long term, it is fair to say the overall stock market has consistently returned about eight percent. Now, if mutual fund managers are pocketing three percent every year from your returns, you will be left only with five percent. Over long-term, you would be losing hundreds of thousands of dollars instead of building your portfolio for your own retirement. To pour salt on the wound, mutual fund managers would be receiving the three percent during a bear market as well. In contrast, index funds or ETFs can have MERs as low as 0.18 percent. Another advantage of index funds is that very little trading activity occurs. As a result, you don’t have to pay tax on the dividends earned each year unless you sell the shares which means the CRA’s share of money continues to work for you. Mutual fund managers are brave and a little lousy as they believe they can “time” the market and trade frequently. As a result, trading commission fees follow each time you do a transaction. Not a great idea. Personally, I have been investing with TD Bank’s e-Series index fund (Fund code – TDB900) for six years now. The MER for this fund is 0.33% as of December 31, 2015 as mentioned in TD’s website. I am using the word “fund” because it is a mutual fund technically speaking but it has a low MER as TD makes it really hard to buy this fund and it sells only online. Not too shabby if you compare it with three percent charged by your gorgeous advisor. My fund has been doing okay so far. On a side note, don’t forget banks’ primary objective is to make money for the shareholders, not to help their customers. Has your helpful banker ever helped you save money on interest? I doubt it. All banks are in the business of generating revenue through selling borrowing and investing products. Lines of credit? Then, they have the audacity to use LOC as an abbreviation. I am sorry but I just graduated from nursing school a couple of weeks ago. For me, LOC will always stand for level of consciousness. Anyways, I get both sides as a customer and as an investor. I am pissed as a customer. $10.95 monthly fee if you don’t have $3000 in your chequing account. Anyone? Hi negative interest rate. And, they give us 0.05% interest on our savings account. WTF! However, as a shareholder, its a different ball game. I smile as I collect my dividends at the end of the year and it’s been increasing every year for the past 6 years. Now, some of you might laugh at me thinking – “Oh, you didn’t go through the financial crisis of 2008-2009 as you started investing only in 2010. Obviously, your fund is doing okay”. I have news for you. I have quietly been praying like a monk for the market to fall (True story: My grandfather was a well-respected monk back in Tibet). I want the market to sink so I can buy shares at a discounted price. My apologies to retirees but I am twenty-seven-year-old as I write (Maybe type?) this blog. History suggests I have enough time to recoup. I am aware about Isaac Newton’s law of gravity. More importantly, I am aware about the financial laws of gravity. I know the apple will fall down one day or the other. I would like to warn you if you do plan to apply for TD Bank’s e-Series fund, it is a little complicated. I vividly remember like it was yesterday when I went to a TD branch six years ago with my brother to open up the e-series fund. The bank representative had no idea about it and had to make several calls to make sure TD offered such funds. I giggled like a nine-year-old girl when she sees her crush. The bank representative offered me to purchase mutual funds with higher MERs. I giggled more. Here’s a cool link to step-by-step guide on how to get a TD e-Series fund. Financial advisors and brokers will try to convince you that they can “time” the market and pick hot mutual funds to buy. Nothing could be farther from the truth. Numerous nobel prize-winning economists have advocated for index funds. Furthermore, pension fund managers are trusted to invest billions of dollars and how do they invest? Most of them use an indexed approach. In his book, The Only Investment Guide You’ll Ever Need – Andrew Tobias declares, “Just by investing all the money you have earmarked for the stock market in the Vanguard Index Trust, you will generally do better than most bank trust departments, mutual fund managers and private investors – with far less effort”. Sure, sticking with index funds might be boring but clearly, investing in index funds with low MERs gives you the best odds of investment success. Ask Warren Buffet, what you should invest in? 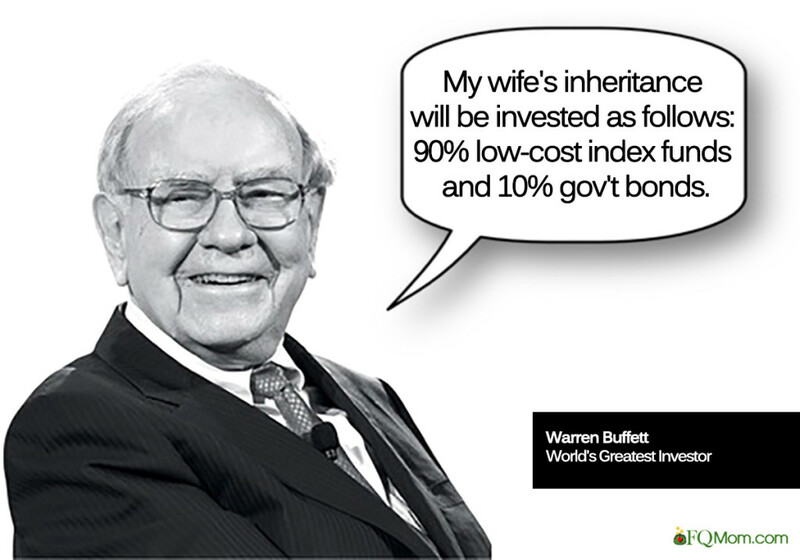 He would suggest to buy index funds. When the “Oracle of Omaha” speaks, you listen. Previous Post Do you know your credit score? Next Post Are Canadians spending enough time planning for their mortgage? Let’s find out. Yes, I yawn because I think about how “well” I will “sleep at night” (SWAN:) after I buy my TD eFund 😋 GREAT article. Should be required reading for all nursing students, heck, all students.